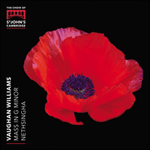 Prayer to the Father of Heaven (1948) sets the texts of John Skelton (c1463-1529), to whose earthy, ribald poems Vaughan Williams had earlier been drawn in his 1935 choral suite Five Tudor Portraits. This work is different both in scale and tone, however. Composed to mark the centenary of Hubert Parry’s birth, the eloquent dedication pays homage to ‘the memory of my master, Hubert Parry, not as an attempt palely to reflect his incomparable art, but in the hope that he would have found in this motet (to use his own words) "something characteristic"'. It is indeed difficult to discern the influence of Parry’s music here. But in the beautiful, strange harmonic shifts, enlisted in the service of a nuanced and individual response to the text, it becomes a fitting tribute. Celestial Father, potential God of might. Of all perfections the Essential most Perfite! Whose power imperial comprehendeth every place! Is, after this life, to see Thy glorious Face. And, after this life, to see thy glorious Face.